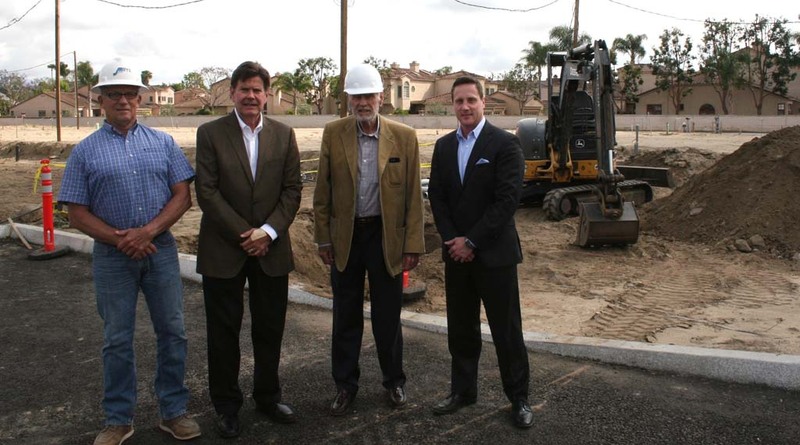 RANCHO SANTA FE — The construction of a new commercial site in Rancho Santa Fe has officially begun. Motorists can get a glimpse traveling on Via Del La Valle, near the entrance of Morgan Run Resort and Golf Club at Cancha de Golf. For the developer, Newport Pacific, Inc. based in San Diego, this site was ideal in serving the residents of the Ranch, Whispering Palms and nearby coastal towns. It’s slated for completion at the end of the year. According to Richard Cavanaugh, president of Newport Pacific Inc., Palma de la Reina is a high-quality office, retail, and residential development located in Rancho Santa Fe. The stats include 21,050 square feet of Class A office in tandem with 10,360 square feet of high-end retail space. Cavanaugh pointed out that Newport Pacific has owned this parcel of land for more than 50 years, beginning when they developed the adjacent Whispering Palms community. “This is the last undeveloped commercial parcel in Rancho Santa Fe,” he said, adding how Palma de la Reina was part of the original vision for Whispering Palms. The mission for this site, Cavanaugh said, was to bring together local professional services, boutique retail, specialty medical office, and services that would be specialized to serve the local community. “There is no other product of this quality and level offered in the Rancho Santa Fe area,” he said. Cavanaugh wants people to know that they have begun pre-leasing the project and are in negotiations with some high-profile tenants who are represented by Lee & Associates. During the construction phase, the developers are driven to attract high caliber tenants. Scott Danshaw, senior associate at Lee & Associates, is also the lead office broker for Palma de la Reina said the site is already garnering attention. “We have already received interest from many localized professional firms, specialty medical offices, beauty and boutique retail, and Fortune 500 companies who are looking to locate their businesses in the Rancho Santa Fe area,” he said. Another lead retail broker for Palma de la Reina, Steve Willmore, who is also vice president at Lee & Associates, said there is a certain prestige with locating one’s business in Rancho Santa Fe. He went on to say that many of these prospective tenants are looking for new construction located in the area in an effort to better serve their clients, patients, and customers who live nearby. “We envision Palma de la Reina as a destination location whose tenants serve the local and surrounding communities, where businesses thrive, and our residential tenants love where they live,” Cavanaugh said.